Brushes For Less Than A Fiver: Worth A Try? 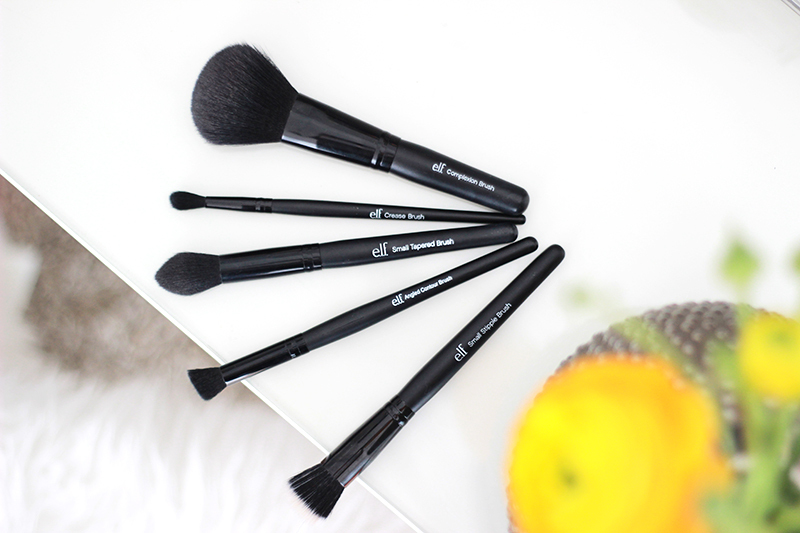 If you've been reading this blog for a while you'll know that I'm a total brush-aholic. It all started off with travel sets by MAC, continued into full size MAC, then ventured into expensive luxury brushes and now I'm completely into budget brushes. But even within budget ranges there are different categories.. And it doesn't get much cheaper than the ELF Cosmetics makeup brushes. Their Studio brushes with black handles look pretty sleek and will set you back just 4 euro a brush. So as a true brush fanatic with a special weakness for good budget finds I just had to put these to the test! I made a selection of five brushes: the Complexion Brush, Crease Brush, Small Tapered Brush, Angled Contour Brush and Small Stipple Brush. These all retail for just 4 euro each - the smaller brushes have the same price as the bigger brushes. I really like how the brushes look, the matte black handle and black ferrule give the brushes a sleek appearance. Out of the five brushes I am the happiest with the Complexion Brush, the Small Tapered Brush and the Small Stipple Brush. The Complexion Brush is a pretty dense and soft powder brush that can also perfectly be used to apply blush or bronzer if you like a medium-sized brush to do that for you. The Small Stipple Brush is perfect to use with cream products such as highlighters or blushes, I like its size as it allows precision application. The Small Tapered Brush is definitely my favourite out of this bunch: it's really good! It can be used to set your under eye concealer with powder, but I have been using it the most to apply powder highlighter. The Crease Brush and Angled Contour brush aren't very bad for this price per se - I just haven't found myself reaching for them and opted for other similar brushes. The Angled Contour Brush has a nice shape but feels a bit scratchy & the Crease Brush is a little too small for my liking. All of these held up pretty well during washing too - only the Small Stipple Brush has lost some hairs but not nearly as much as some of my high end brushes shed. The bigger brushes regain their shape after drying perfectly too - I do use a use a type of brush guard when drying, but you should do this for all your brushes as it really keeps them in much better shape! Even though these of course don't feel like artisan made high quality brushes, I am still quite surprised by the quality you get in these for just 4 euros.. 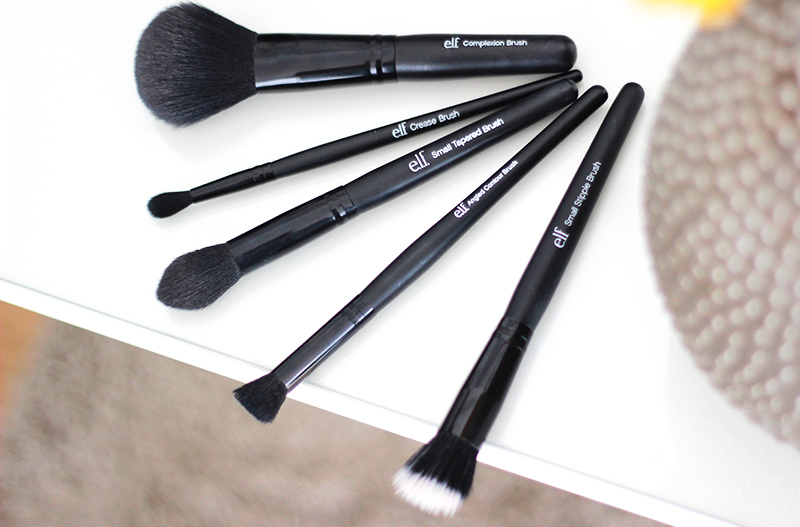 These really are a great budget alternative if you can't spend big bucks on makeup brushes. And a little preview: in the US recently ELF launched two new brushes that I can't wait to get my hands on: the Studio Contouring Brush and the Ultimate Blending Brush. They look SO good! I found a good article with pictures on them here, if you feel like taking a look and drooling along with me.